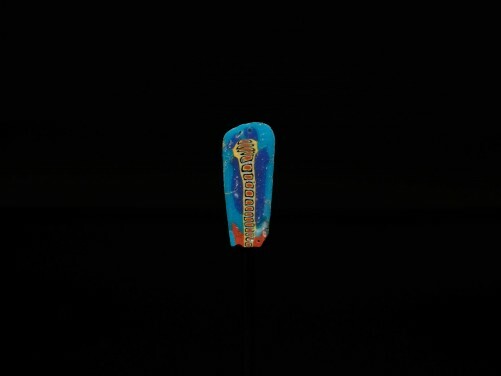 DATE 3rd Century B.C.-1st Century A.D.
Ptolemaic, 3rd Century B.C.-1st Century A.D.
Mosaic glass inlay preserved from the end of a bar, depicting the vertebrae of a cobra outlined in opaque deep blue, opaque yellow, and opaque red in a matrix of opaque light blue. This example compares to horizontal strips which serve as the lintel of a shrine. Mr. John J. Slocum, Newport, RI. (1914-1997), formed his collection while serving as a US Diplomat to Egypt during the 1960s. Later, he served as Assistant to the Director of The Smithsonian, was appointed by President Reagan to the Presidential Cultural Property Advisory Committee, and was a Trustee Emeritus of the Archaeological Institute of America. His collection of Medieval Crusader Coins was sold in a single-owner sale at Sotheby’s, London in 1997. Polished surface on one side, opposite with some weathering and a lower edge chip. 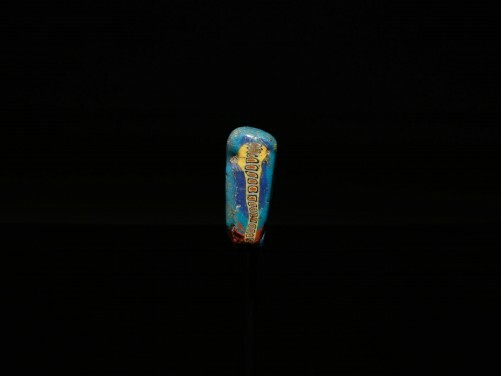 Goldstein, S.; Pre-Roman and Early Roman Glass, Corning Museum, p. 231, no. 672, for a parallel. Kofler-Truniger catalog, p. 150. Pl. VII, no. A212-a,b.